We are proud to announce that we have gained two new writers, Matt Rosenhein and Dan Spiers. Both have joined theiLife.com writing team in hopes of bringing new perspectives to the site with Matt focusing on hardware and Dan on gaming as well as switching from PC to Mac. Look out for posts and other content from both of them in the near future. At about 1:00AM EST, Thursday December 20th, Think Secret has published a press release stating that Apple and Think Secret have settled their lawsuit and Think Secret will no longer be published. 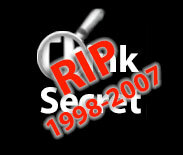 Think Secret was a source for inside Apple information and rumors since 1998, with many reliable predictions over the years. However durring the past two years, Think Secret seemed to scale back on the number of posts and loose prediction accuracy, resulting in a loss of popularity. Rest in Peace Think Secret, 9 years old.